Apart from two large urban areas – Baku- Sumgait and Makhachkala-Kaspisk – and the Iranian coast on the southern shore, a very densely populated coastal strip where one agglomeration leads into the next, most of the population living on the shores of the Caspian is rural, with strong religious and family traditions actively maintained. Some cities such as Baku have experienced very rapid urbanisation. In the early 1900s Baku was a city of 248 300 inhabitants, whereas the population now stands at about 2 million. 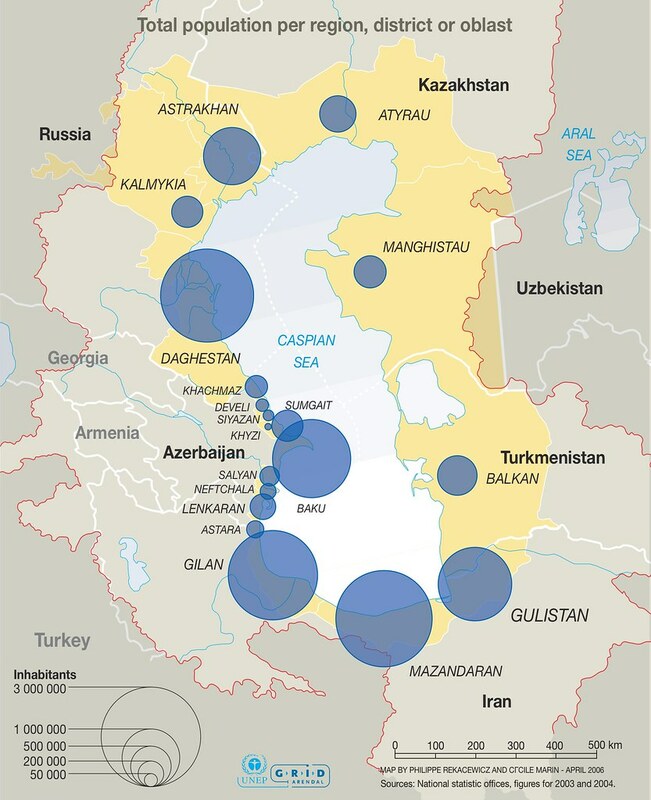 It is consequently not surprising that several countries and provinces – Iran, Daghestan, Turkmenistan and parts of Azerbaijan – still enjoy very high population growth rates (in excess of 10 per 1 000). Although the fertility rate has dropped significantly over the past two decades, or perhaps longer, the authorities must nevertheless cope with all the health, education and employment problems associated with a rapidly rising, youthful population.